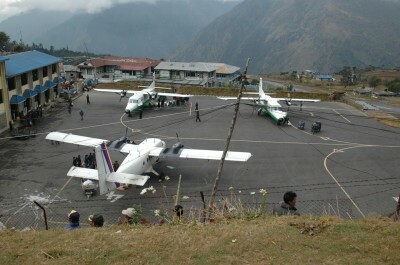 I have landed at the Nepalese Lukla air strip two times, once in the early 1990’s and again in 2009 and though there have been some improvements it still remains one of the world’s most dangerous airports (ten plane crashes from 1973 thru 2013 with several tragic ones with loss of life of all passengers and crew). 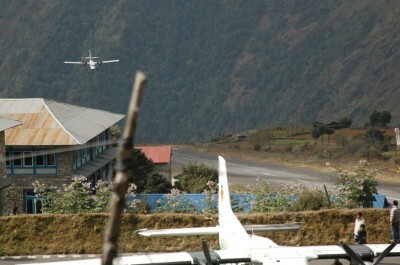 My first experience with the Lukla airport it was a single gravel lane. I remember as you looked down the narrow aisle of the Twin Otter turboprop plane through the front windshield past the two pilots at the tiny vertical line of our destination you knew it was an unlikely place someone could make an aircraft land safely. At the foot of the strip was a cliff that dropped sharply into a river valley and at the end was a vertical stone wall with its top lip rolling up in green pasture to a tall dark hill. There really was no place to abort a landing once the approach neared the lip. 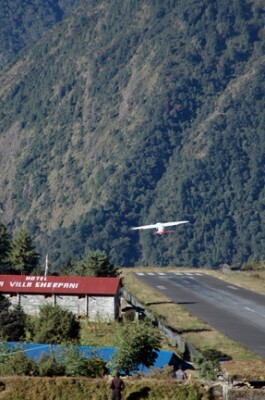 The actual runway angled steeply uphill which assisted in slowing down the planes on landings and providing additional speed on takeoffs. 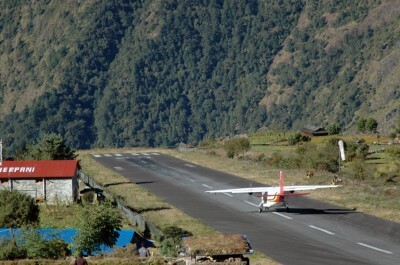 Both of the landings I endured were filled with cabins of nervous chatter as two rows of tightly packed passengers all strained towards the middle of the plane to watch the small vertical line grow larger as the aircrafts dropped at a steep angle for their one way commitment of leaving the sky. Take offs were just as exciting as the planes would rev the engines to a high RPM and suddenly release the brakes rolling down the steep angle of the runway towards the cliff at its terminus. The planes would do a small dip as they left the ground similar to the dip one feels as a cable car passes a pylon and drops and your stomach gets a quick queasy rush. As the planes pulled power and lift upwards the passengers would erupt in applause for the pilots and everyone’s relief that we didn’t continue dropping into the rivers chasm.